(1 Customer Reviews) | Write Review 6 issues per year Unique Bride is the wedding magazine with a difference, aimed at brides that do not want to follow the norm and want to do something different. Too many people are feeling pressured to have a wedding in a certain style. We say, forget that! Your wedding should reflect nothing but you, your loves and your love for one another! Your day, your way. Free Love, Marriage in the Mountains, 10 Top DIY Flower Tips, 7 Real Weddings, Great Wedding Bake Off, Zombie Love Bites, Caravan of Love, Cold Feet? An Inflatable Church! 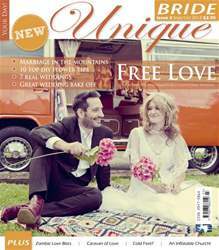 You'll receive 6 issues during a 1 year Unique Bride magazine subscription. It's so exciting to see the different options that people can have for their weddings - so many magazines offer really conventional or trendy ideas for weddings but this magazine shows the potential of what can be done! I found this title through Vintage Life magazine, and it's great if you have a rockabilly twist to life, or enjoy any eclectic and eccentric. You'll receive 6 issues during a 1 year Unique Bride magazine print subscription.